Most weekends, when I’ve been to the farmer’s markets, had my brunch, and caught a matinee, I find myself at Rapisarda, the Cobble Hill store owned by Brazilian designer Claudia Rapisarda. I’m not alone. There’s always someone half-shopping, half-visiting Claudia. The store itself is hard to describe. A unique collection of pieces that she both designs and brings from Brazil, it vibrates with color. It was during one of my visits that she tried to explain how to make farofa, a dish I had been reading about and wanted to try. Claudia can’t not help someone, so she agreed to come to my apartment and show me herself. 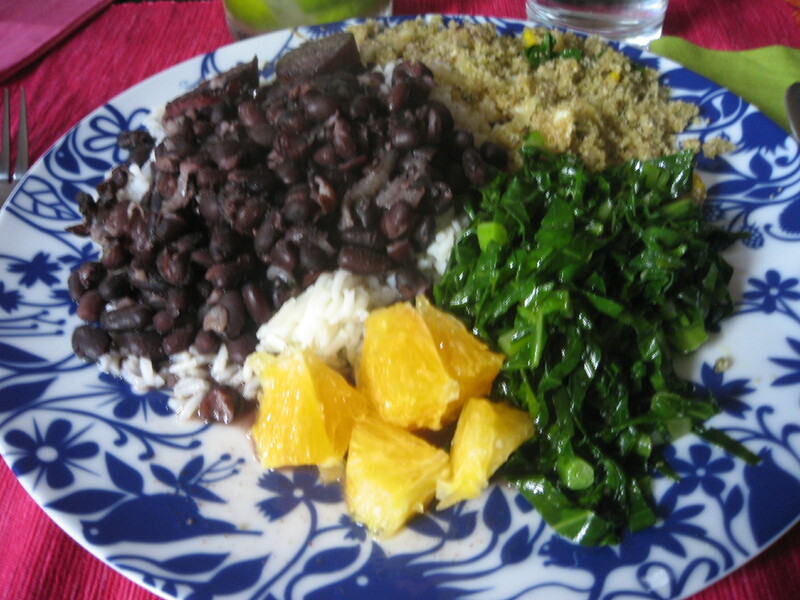 In addition to the farofa, the menu grew to include: feijoada, a black bean stew with pork (using kielbasa as a substitute for Portuguese linguiça); couve, collard greens sauteed in olive oil and garlic; fluffy white rice cooked with more garlic; sliced oranges; and, of course caipirinhas. After a quick trip to Buzios, I thought I had everything we needed – farofa, kielbasa, bananas, a Yorkshire terrier named for an iconic Brazilian film. Quickly assessing the situation, Claudia banished the instant farofa for the manioc flour I had bought as a just-in-case, pet the dog, and decided we would need more garlic, a lot more. I can be very precise (not to say prissy) about following recipes and started taking notes. Within the first ten minutes, Claudia ran through the establishment of Pedro I in Rio de Janeiro in the 19th century, chopped the greens, gave me the history of the feijoado, held a full can of olive oil upside down over my sauce pan to start the rice, and briefly demonstrated a samba to the music my sister was playing. I gave up on the notes and started chopping garlic. Claudia started with the beans right away. As she explained, most families always have a pot of black beans going, for themselves or for anyone who may stop by that day. Soak the beans overnight with just enough water to cover. * Bring one pound of black beans to a simmer with 6-8 cups of water (in addition to their soaking water), two bay leaves and salt. Add a half pound of kielbasa cut into 1-inch slices. Lower to medium heat and cook covered for about one hour, checking regularly. 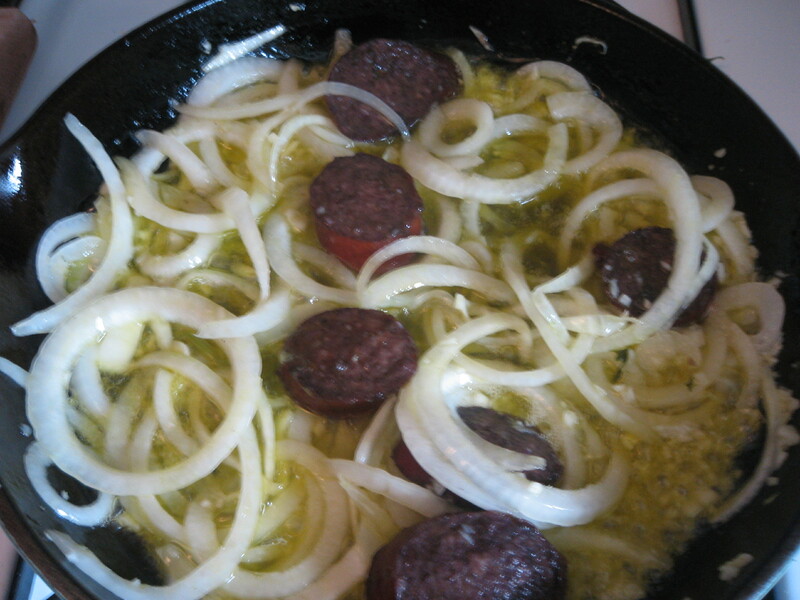 To make a sofrito, sautée half of a large, thinly sliced onion with minced garlic, and a few pieces of the kielbasa, taken from the simmering beans, in a generous amount of olive oil over medium heat. Cook until the onions are translucent and the garlic is golden. For a richer broth, take 2-3 ladlefuls from the beans, including a few pieces of kielbasa, and puree till smooth. Return the pureed beans to the pot and add the sofrito. Continue to cook uncovered until the beans are tender and the sauce has thickened slightly, about one more hour. Adjust salt to taste. Serve over fluffy white rice. *I should confess that I forgot to soak the beans until a couple of hours before we started cooking. Since we didn’t have time to allow much of the liquid to evaporate, I strained some of the stew and saved the broth to have as a light soup at Claudia’s suggestion. 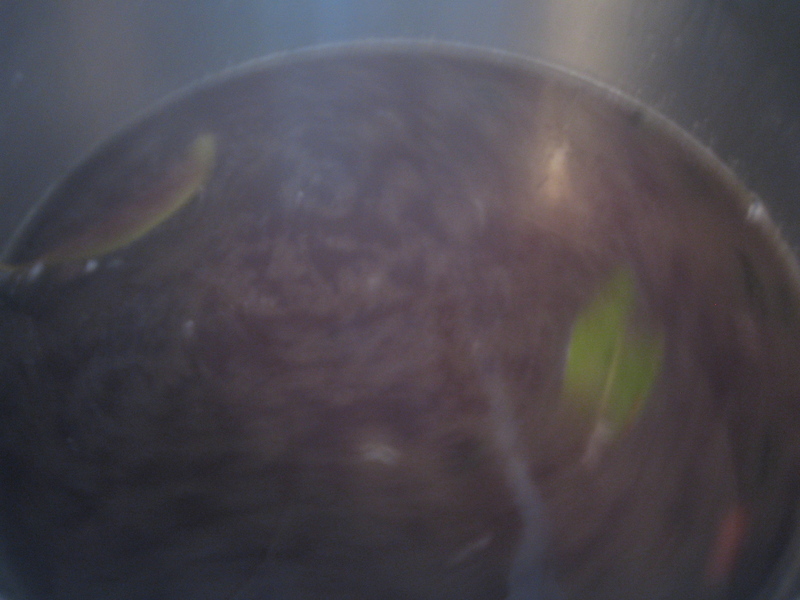 Both the beans and the broth freeze well so, while it may seem labor intensive, one large batch can last a long time. 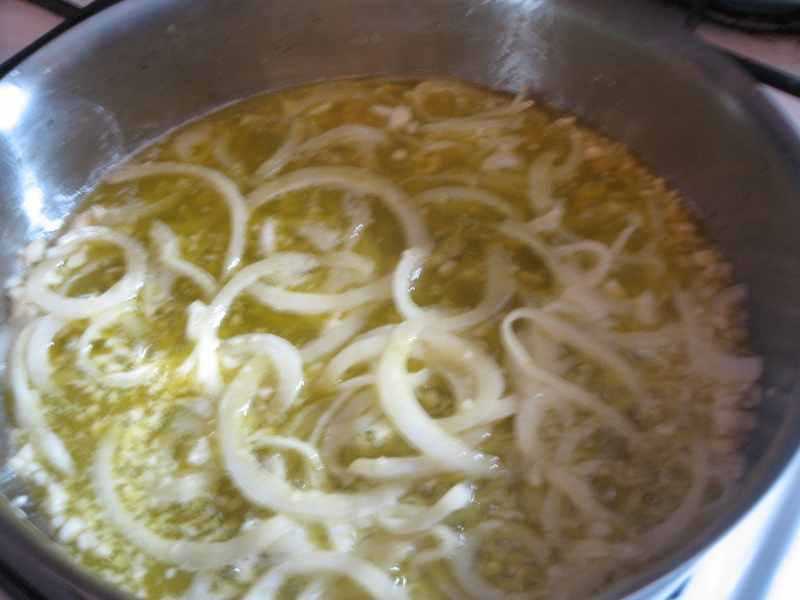 To make the sofrito for the farofa, sautée half of a large, thinly sliced onion and minced garlic in a generous amount of olive oil and approximately 2 tablespoons of butter over medium heat. Cook until the onions are translucent and the garlic is a deep golden color. 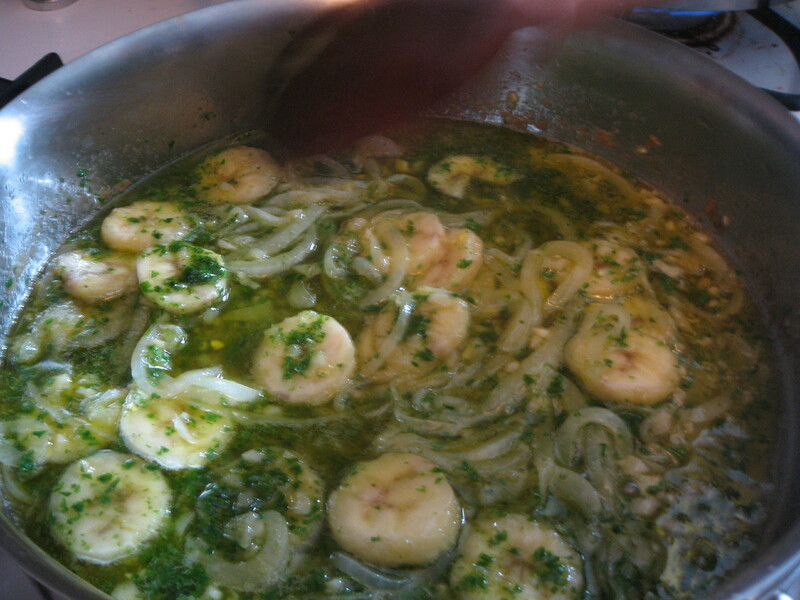 Add one banana, sliced in 1/2-inch pieces and a 1/4 cup of roughly chopped parsley to the sofrito. Cook until the bananas have softened slightly, about 2-3 minutes. 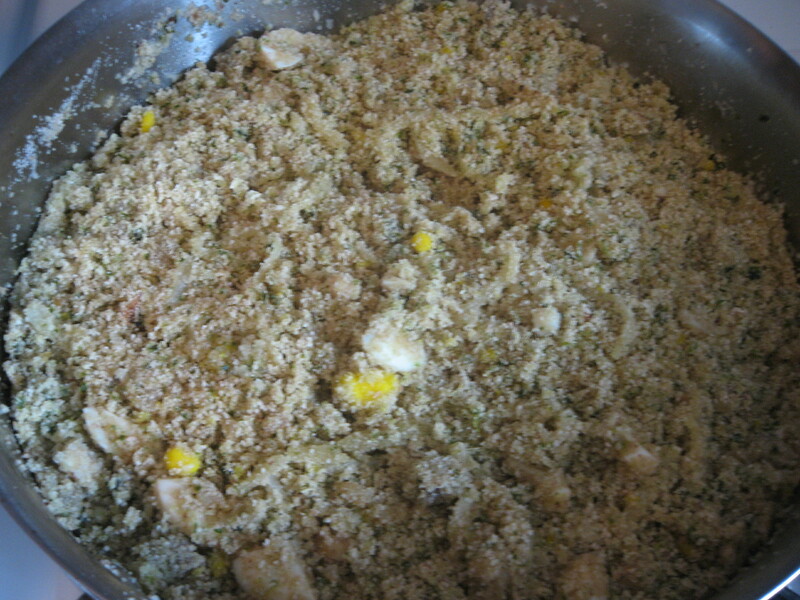 Add 3 cups of manioc flour and combine. Add 2 hard boiled eggs, sliced. Cook, stirring constantly, until the farofa is lightly toasted, about 5-7 minutes. Add salt to taste. 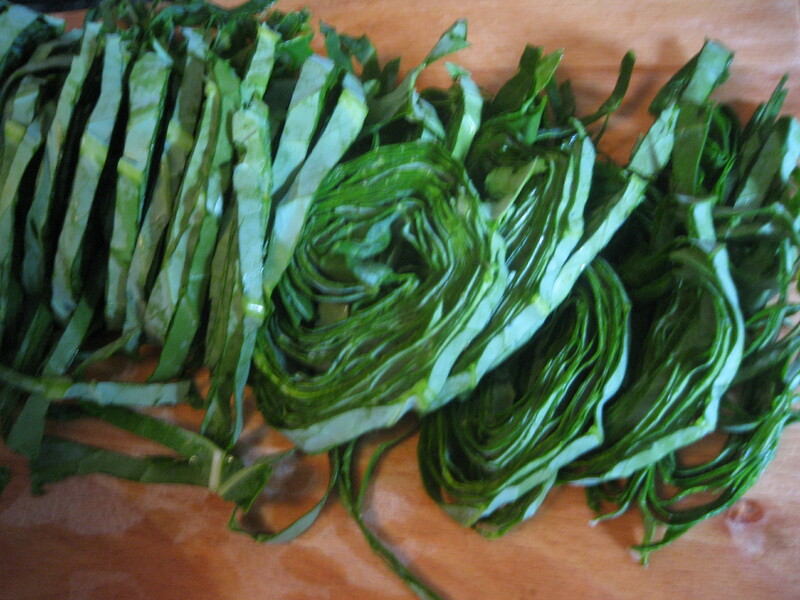 Rinse the collard greens or couve, then stack the leaves on top of each other, roll into a bundle, and chop into a chiffonade. Heat the olive oil until just fragrant then add about a 1/4 cup of garlic over medium heat till golden. Add the couve, then sautée till bright green and tender. Add salt and pepper to taste. While we waited for the feijoada to finish cooking, Claudia mixed up a quick batch of caipirinhas. The final result was as vivid and colorful as Claudia. 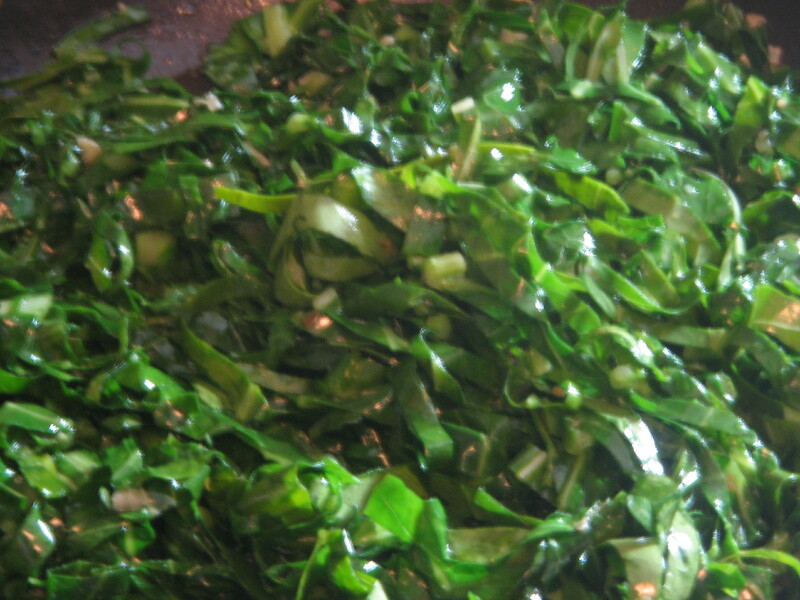 The garlic melted into every dish without being overpowering, the dry farofa provided the perfect balance to the rich beans and bright greens, and the oranges brightened the mix. For a little heat, we added chopped serrano chiles to the beans. 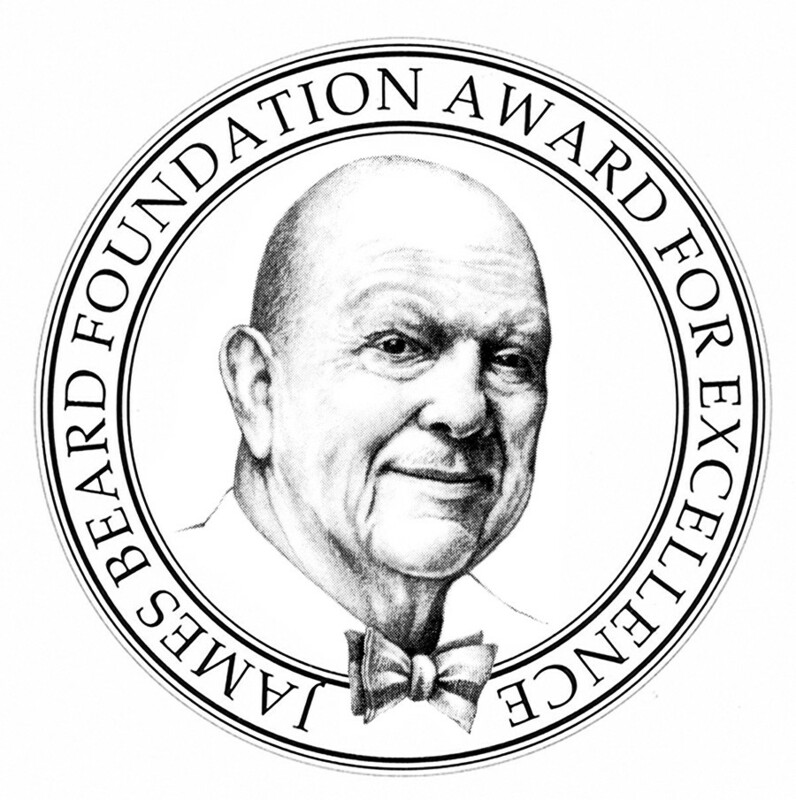 It’s such a pleasure to learn something new that you know you’ll be enjoying for a long time. It’s such a privilege to have an afternoon of good food, good music, and great friends. Claudia Rapisarda is amazing! I highly recommended her and her store! 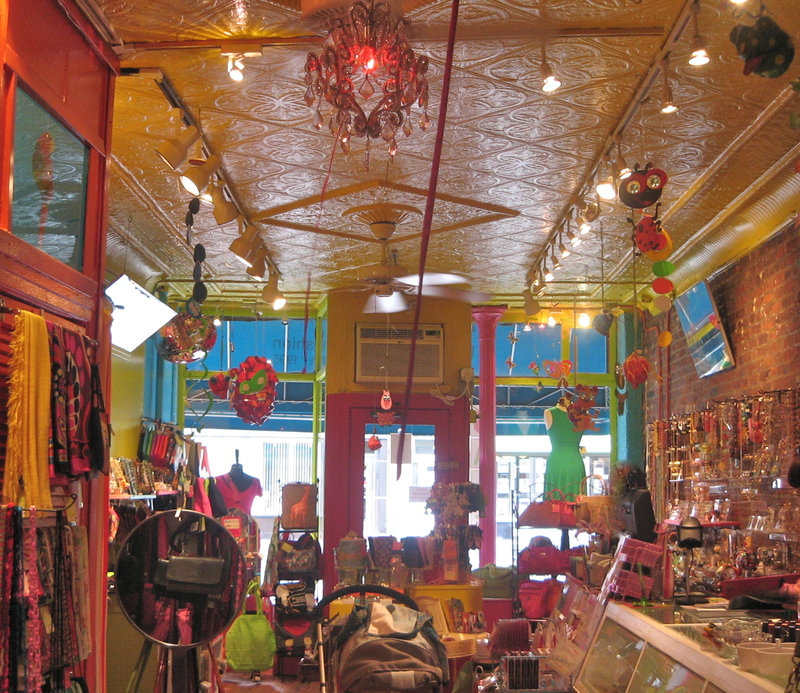 the rapisarda store is the best not only in brooklyn but in new york city ! the things she sells are amazing, the store is so beautiful, and if you are lucky you will catch up an amazing conversation and will grow a better person ! and if you are still luckier you will meet her sister , and the watch out !!!! Wow!! 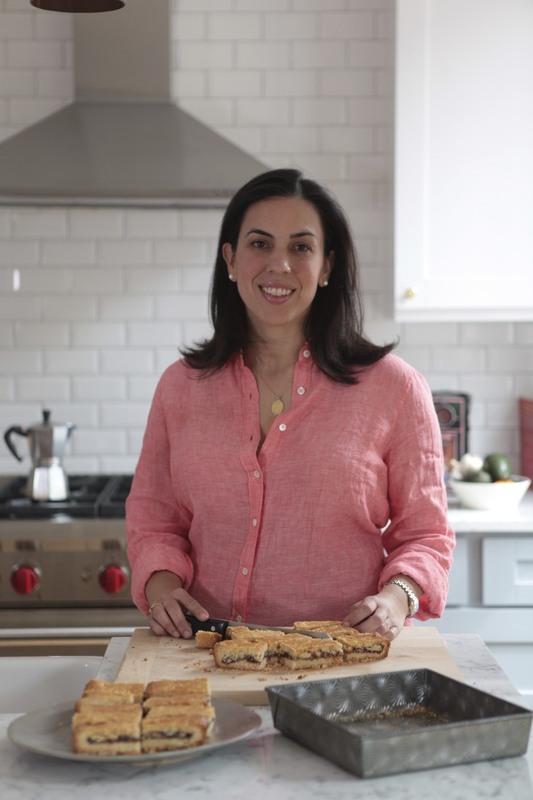 I am constantly in awe of your story-telling skills, passion, and ability to go beyond the expected to the true heart of the moment and the food. Brava Bella!